NASHVILLE, Tenn. -- A violent disturbance broke out involving more than 20 teens at the same Nashville juvenile detention center where more than 30 escaped earlier this week. About 28 teens - some of whom had also escaped during Monday's massive breakout - were involved in the latest incident at the Woodland Hills Youth Development Center, which began late Wednesday night, Tennessee Department of Children's Services spokesman Rob Johnson said. The teens had gotten out of their dorms and were roaming the campus. Video shot by CBS Nashville affiliate WTVF-TV showed teens chasing and assaulting a man who appeared to be a staff member at the detention center. Photos published by Nashville newspaper The Tennessean showed teens in the detention center yard carrying sticks. One photo showed someone spraying a fire extinguisher. Two staff members at the center suffered minor injuries, Johnson said. At one point, says WTVF, several teens were seen on the roof of one building, with metal objects and rocks. Some were also spotted on the ground, with baseball bats and metal pipes. Teams from the Tennessee Department of Correction, who are trained to handle uprisings, entered detention center early Thursday and took the teens into custody. Ten described by authorities as ringleaders of the incident were brought to another detention center, Johnson said. The rest were returned to their dorms. While the teens were outside their dorms, police formed a ring around the detention center's perimeter fence to make sure no one escaped. 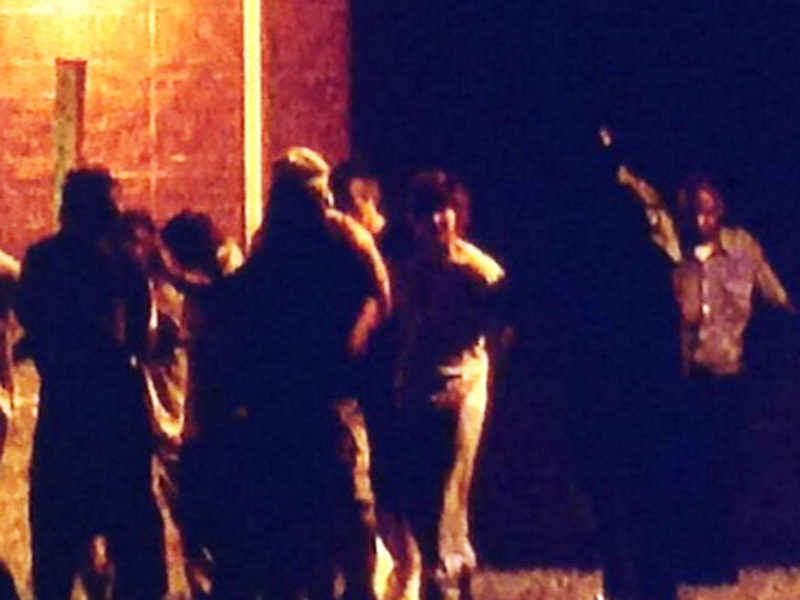 Thirty-three teens escaped from the detention center Monday night, WTCF reported. Officials said they had kicked out metal panels under the windows in common areas of their dorms to reach the courtyard and slipped out under a weak spot in the perimeter fence. Six of them remained at large early Thursday. Johnson said the same panels kicked out during the Monday escape were kicked out again to get to the yard Wednesday night. Officials have begun repairing and reinforcing the panels and will try to get concrete put at the bottom of the perimeter fence, Johnson said. The detention center has a long history of violence, allegations of sexual abuse and previous efforts to escape. In 2010, the U.S. Department of Justice ranked Woodland Hills as 13th in the country among juvenile facilities where there had been reports of sexual abuse by staffers.